This month we are excited to feature Jessica Smart with Real McCoy Home Care. 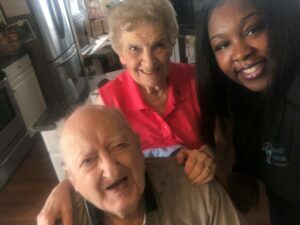 She recently helped new client Mr. Nick and his wife, Rosemarie with their start of care. The family provided feedback that the care she provides has been “5 star”. Her caring spirit, dependability and quick smile exemplify the Real McCoy of caregivers. Congratulations Jessica! ← Are Your Goals as a Caregiver Too Big?